I live in an area that does not really acknowledge Christmas. I have seen chocolate Santas in a few shops and have heard Christmas pop songs on BBC Radio 2 on the Internet, but otherwise there is very little sign of the holiday over here. The thing is, I quite like Christmas! There wasn't a Jewish school in the city where I grew up, so I went to the local Comprehensive school. There I learnt a fair bit about Christmas in the run up to the holiday, though of course we celebrated Chanukah in our own home. As a result, I find it rather fun to sit at my desk and listen to the Christmas songs I remember from years past (I like to have a good singalong when there's no one home!). I am quite well versed in all my carols too! I do have a papercut art business and some people, no matter where they live, still need Christmas cards. I personally send my handmade holiday cards to a few friends back in the UK, while other people require cards to send to their clients abroad. After all, they are celebrating Christmas, even if we're not. This year's cards have brightly coloured Christmas trees on them. It was fun to cut out the simple triangular shape of the tree and add some "twinkling" lights. 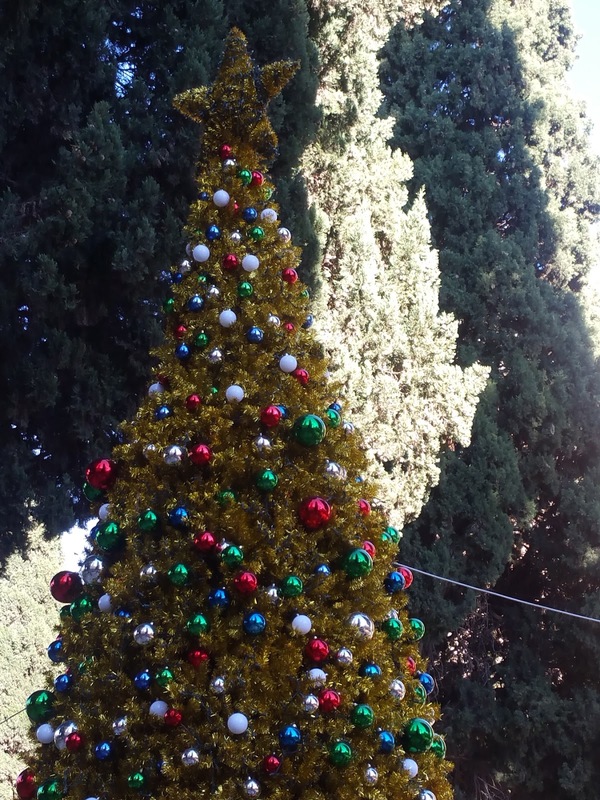 My trees were not dissimilar to the trees we spotted at the YMCA in Jerusalem, below. I read about a Christmas Holiday Bazaar being held there and was intrigued enough to go and have a look. As it happens the trees were just about the best thing there. I got it right with my cards though. One customer wrote to say "Thank you for the cards. They're perfect - so much nicer than the ones in the shops." Happy holidays to you all and best wishes from the place where it all began, even if there's no evidence of it on the streets! * This post has been shared on Make It Pretty Monday, Outdoor Wednesday, Wow Us Wednesdays, ABC Wednesday, Wednesday around the World, Wordless Wednesday, Share Your Cup Thursday and Little Things Thursday. It's necessary to see what each people celebrate. In the last four weeks I wrote in my posts of the small things finding Christmas feeling. Now I wish you a wonderful time. Sorry for my lateness. Yes, you are living at the place of Christmas! You only sing when no one is home? (am smiling - are you a bathroom singer too?) Many thanks for sharing these fun Christmas trees with ALL SEASONS! My wish is for your business to grow exponentially! Your Christmas cards are lovely thank you forsharing fine talent with us. a time of joy and giving, but of course they celebrate Chanukah. as you do. and Christmas wishes from ABCW. I'm the Jew who loves Christmas too! I have the radio station on all season and love the cheer and holiday lights. It's felt weird to not have Chanukah yet! Your cards are really lovely! Enjoy listening to all the Christmas songs! Love what you created, I featured Christmas cards this week too. Isn't Christmas music wonderful. Your cards are so bright and cheery! I love how you used nontraditional colors. I would not have thought to use purple in the background and it works wonderfully! Thanks for sharing with SYC. I love your cards, Lisa, and all of your posts throughout the year! Happy Hanukkah to you and your family. Your Christmas cards are adorable Lisa! Growing up I wished I was Jewish since the festivities last longer. 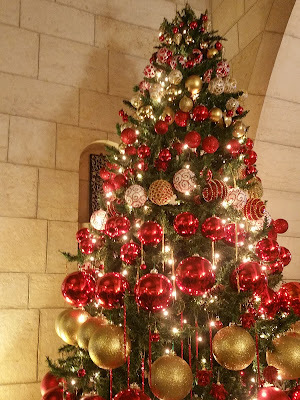 :) Christmas certainly is a lot of fun though with its decorations, carols, etc. I love your Christmas tree card..
Festive! I made my own cards this year too. A photo card glued with a real photo. Happy New Year!